Our new Heat Pro package produces a total of 1,272,971 BTU. This bed bug heat treatment package has all the equipment to efficiently treat one big job or three ‘normal’ ones. It includes one Titan 800, one Titan 450, and one ePro 600. The Heat Pro package is the perfect heat equipment package for anyone professionally getting started with heat or expanding their equipment portfolio. We have assembled this package for Pest Control Operators, Student Housing Managers, Senior Housing Maintenance, and Multi-Unit Property Managers. The Heat Pro package includes everything you need to efficiently eliminate your frustrations created by insect pests: equipment, training, and on-going support. The best thing about the Heat Pro package is the introductory price: $19,999—only 1.6¢ per BTU or $3.57 per square foot of treatment area! Price, speed, flexibility. GreenTech Heat Solutions provides all three in an easy-to-use package. Being successful has very little to do with being flashy and raw straight-line speed. It’s all about the execution and delivery. 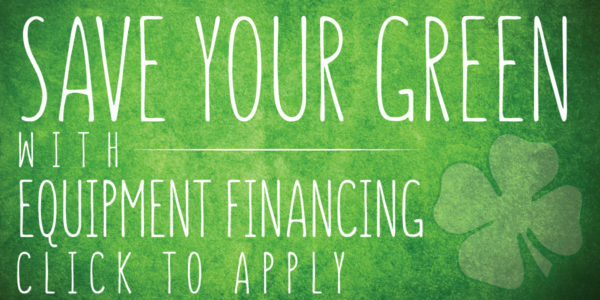 Partner with GreenTech Heat Solutions for your success. A flashy ride without proper training will not achieve the desired results. All GreenTech heat packages include the Master Heat Technician Certification training. We do not sell equipment — we sell an effective heat solution that kills bed bugs, black widows, lice, fleas, drain flies, cockroaches, brown marmorated stink bugs, weevils, beetles, spiders, termites, and almost every other insect pest. The Titan propane heaters generate significant volumes of energized airflow that eliminates odors and flush dust and allergens from the structure. We are available when you need us for technical assistance and treatment guidance. What’s it take to start killing bed bugs? One of our competitors has a $105,000 electric bed bug system that requires a trailer-mounted generator to produce just shy of 200,000 BTU with eight 130-pound heaters. 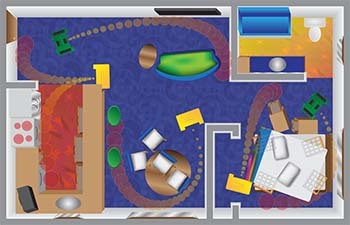 Their system treats up to 3,200 square feet and costs 53¢ per BTU or $32.98 per square foot of treatment area. You pull up to a client’s jobsite with your truck and trailer and you look flashy. Until, that is, you and your heat team need several hours to get almost a ton of equipment unloaded, set up, and effectively heating. Let’s not forget hauling each of those 130-pound heaters and twenty fans back down to the truck at the end of a long day. Here’s to hoping you’re not treating on a second or third floor without access to an elevator! 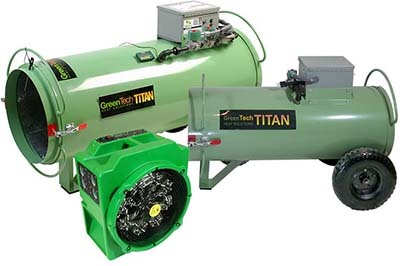 Our GreenTech Titan 800 propane bed bug heater weighs 140 pounds and produces more than 990,000 BTU. A single Titan 800 generates enough heat to successfully treat a 3,000 square-foot structure in a day. It’s about the same size as one of the competition’s electric heaters and can output energized treatment air with enough air-flow-force to treat the rooms on the third floor... while it remains firmly planted on the ground outside the building. Technicians utilize lightweight mylar ducts to move the heated air throughout the jobsite. When needed, additional airflow is accomplished with our AM4000 air mover fans. We also offer the slightly-smaller propane-fired Titan 450. At 100 pounds, this little powerhouse still produces 513,000 BTU and generates enough heat to treat a 2,000 square-foot structure in a single day. 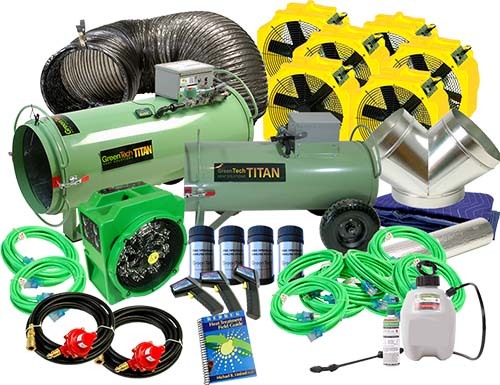 The Titan 450 has three significant advantages over the larger Titan 800: it fits in a small SUV or truck, it can be safely operated in a hallway, and it can run from a 5-gallon propane tank. Both the Titan 450 and Titan 800 are made in America and come with a two-year warranty. On the electric side, we have the ePro 600 produces 22,971 BTU in a compact, 35-pound package that doesn’t require a generator. When paired with the included Power Station, sufficient treatment power is readily available from almost any building. Compared with our competition, we have the lead with the all-important power-to-weight ratio: pound-for-pound, our ePro 600 produces three times the heat without straining your back. The GreenTech Heat thermal eradication process utilizes high-energy, high-pressure, convected air to kill insects. The competition’s heaters do not generate an aggressively-convected airstream to impart lethal heat into treatment areas. Convection allows GreenTech Heat equipment to address larger treatment areas or shorter treatment times. Let GreenTech help you with a comprehensive green heat pest control solution with significantly more power and training, at a fraction of the cost of our competition. Every living organism has a thermal death point. Attain or exceed that temperature for the required time, and you will achieve a 100% kill. Guaranteed. 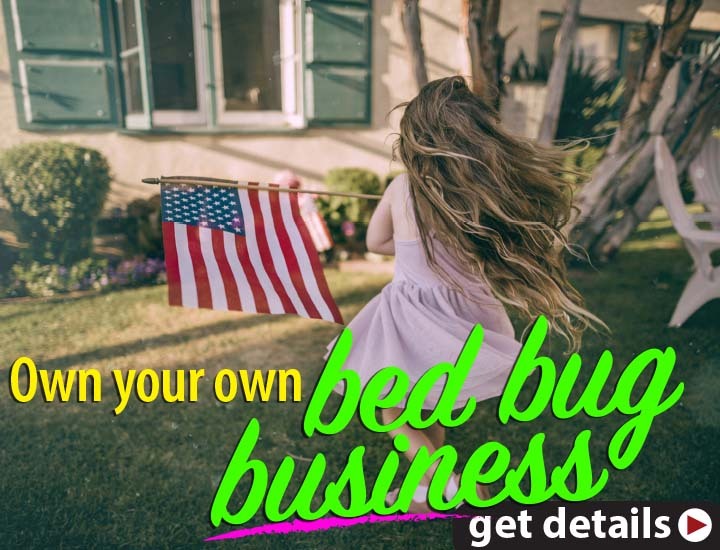 Bed bug lawsuits, settlements, and judgements are becoming more common for many industries. Both responsive and prophylactic heat treatments can go a long way to demonstrate that building owners care about the well-being of their tenants, residents, and guests. Our equipment will zapp bug and black widow with thermal remediation.